Warm those cold hands on a hot cup of coffee and choose between a Caramel or Vanilla latte, and for that extra indulgence, it comes topped with cream. 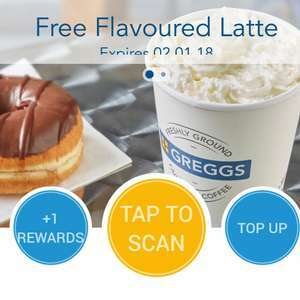 As an early present, we’ve popped a free flavoured latte reward onto your account, so just pop in and scan your Greggs Rewards app as normal. Got mine just a minute ago..
For those that do have it, have you used your free roll and coffee one yet? im thinking maybe that needs to have been used by now before the new one triggers? mine still has the free roll +coffee one. 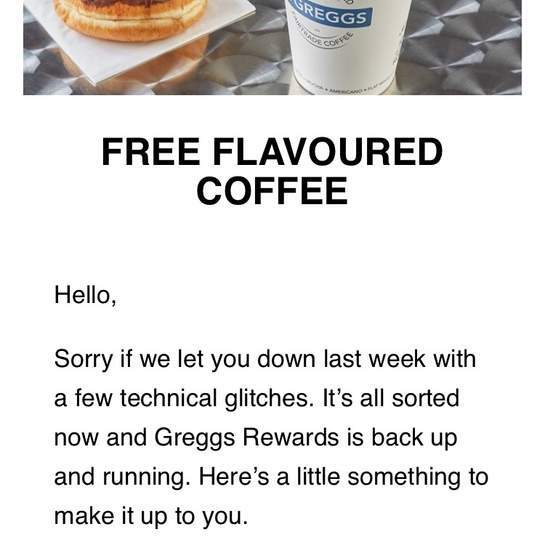 Not on any of my accounts but i did have the breakfast roll, /❄ drink offer which i couldn't redeem.So i emailed Greggs and just got an  back and it's back in my account until January. Got both the breakfast roll and free latte deal both currently active on my account so they both can be held at the same time. Got both the breakfast roll and free latte deal both currently active on …Got both the breakfast roll and free latte deal both currently active on my account so they both can be held at the same time. yep mine literally just came through now, coming through in drips and drabs as mentioned above. Logged out and back in and the reward popped up! Got a birthday treat,latte and breakfast roll to redeem. Deal is on my app. Offer available until 2nd January. Can you use two free rewards at the same time - I have the free breakfast bap and now the free coffee? Thank you. Nice one. On my app. Their coffee used to be shyte, but I think they have changed it, when I got my free first cup free from the app. Nice one. On my app. Their coffee used to be shyte, but I think they have …Nice one. On my app. Their coffee used to be shyte, but I think they have changed it, when I got my free first cup free from the app. I have the free coffee on o2 priority from Cafe nero and I dont enjoy it much as their blend can sometimes be too bitter. Even the almost free coffee from Waitrose is an even more of a lottery as taste always fluctuates. Can you use two free rewards at the same time - I have the free breakfast …Can you use two free rewards at the same time - I have the free breakfast bap and now the free coffee? Thank you. Where is the use by date on these offers? Picked up mine today . My app had logged out and it was a nightmare to log back in forgotten password etc. I then go into the shop and the store didn't have wifi . Had to walk out and log on using my data as that also didn't work in the store . Got my latte in the end and it wasn't worth the hassle involved . Apparently it didn't work but he said the system kept messing up so he just gave it to me . It is still showing in my app .